Most weeks, 361 Capital posts a research report examining various market related topics. They’re generally excellent, and the final report of 2013 contained a chart (Figure 4) which looked at the annual price performance of the market. There were a few takeaways from this chart that I thought were useful. Firstly I’m offering a disclaimer, particularly in light of my post yesterday where I alluded to the market’s fixation on setting expectations. Just because the market behaved a certain way in the past has no bearing on what will happen in the future. The market could go up. Go down. Go nowhere. Bane could take over the NYSE. Who knows what else?? Barry Ritzholtz had the right idea. I view predicting the future moves of the market as a colossal waste of time. 2013 will be tough to repeat. 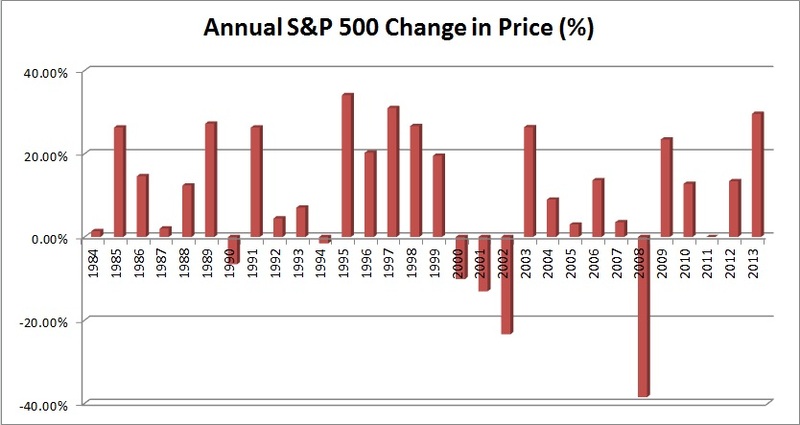 Aside from the 4-year stretch we saw in the mid-1990’s, the last time the S&P 500 increased for two consecutive years above 20% was 1954-55. The phenomenon did occur a few times earlier in the last century (1897-98, 1904-05, 1924-25, 1927-28, and 1935-36; note that the DJIA was used for the years before the S&P 500 was established), but in the past half century it’s been a rare occurrence. Again, don’t expect the market to increase 12.41% just because that’s what it’s done on average following years like 2013! The point here is not to predict, but rather to show what has occurred before. Given the trauma experienced around with last recession, many writers, thinkers, and investors are seemingly on pins and needles, waiting for the other shoe to drop. If fundamentals remain strong, earnings continue to improve, and no unforeseen calamities strike, then there’s no reason the market can’t continue to grow! It may not occur at the level of 2013, but history shows us that – more often than not – a year like we just experienced is not in of itself a predecessor of economic calamity.